Richard Bartlett has a knack for turning the unsalvageable into the stunning. For nearly two decades, he has been restoring and constructing barns scattered throughout Maine, New Hampshire, and Massachusetts. In most cases, Bartlett is the specialist that’s called in to save these leaning, sagging, and rotting pieces of history when no one else can. Bartlett's process is all his own. He relies on a hydraulic jack when rotted sills, corner posts, and side paneling needs replacing. He also relies on suppliers like Feuer to mill and customize the products he will need to replace the unworkable lumber. Bartlett has gotten this process down to a science. Deciding just where to make these lifts and how to keep the separated pieces in line is the challenge. One that makes him the coveted barn restoration expert that he has become. "I love what I do because I know that I am saving pieces of New England history," Bartlett says of his work. "I'm the last resort to preserve these beautiful barns and the unique architecture that would otherwise disappear." His most recent project was actually not a restoration at all but a custom, livable barn built from the ground up. This 1600 sq. 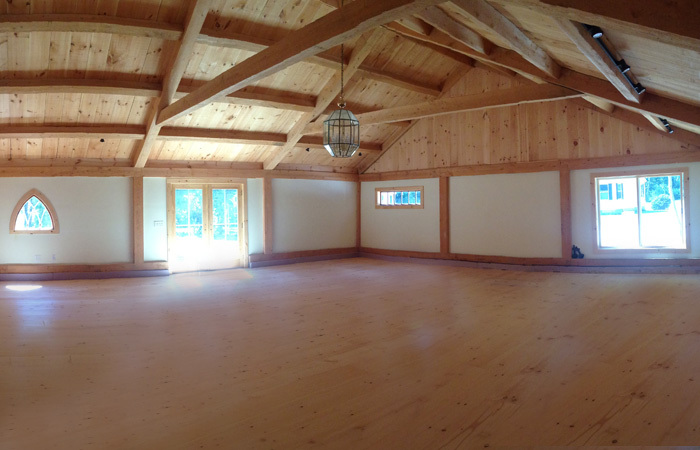 ft. barn -- located in Kittery, Maine -- was created with all the amenities of a normal home and to the exact specifications of what the owner envisioned, including 18 ft. ceilings with exposed beam and barn boards. For these parts of the project, Bartlett required rough-sawn hemlock. Just as he has for nearly twenty years, Bartlett trusted Feuer Lumber to mill, customize, and supply his lumber. 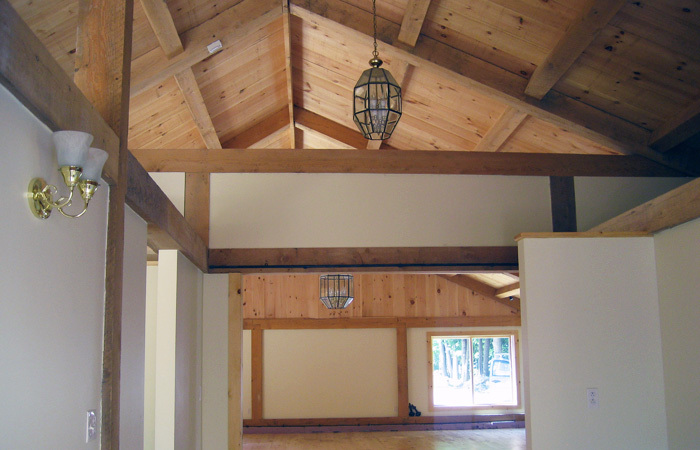 "I went with rough sawn hemlock for the beams and the barn boards on this project. I choose hemlock for its strength, to replicate the beams being replaced, and to preserve the unique nature of the barn itself,” adds Bartlett. "I choose Feuer because they always deliver on site and on time, I’ve never had to reject boards, and their pricing is extremely competitive for the quality of the lumber they provide." Bartlett’s journey into barn restoration is also when his relationship with Feuer began. Back in 1997, he was approached by a real estate agent in Rye, NH. She mentioned a beautiful old barn that was in dire need of attention. The barn was slated to be demolished unless someone could somehow preserve the original integrity of the structure. Bartlett said he could take care of it, hoped that was actually the case, and then tracked down Feuer through the grapevine to supply his lumber. Bartlett credits this as something of life-altering epiphany. "After years of doing construction and carpentry, the approach to restoring these barns just kind of came to me," he says. "This specific barn had settled and had pretty severe rot but somehow it just seemed like common sense of how I could bring it back to life. 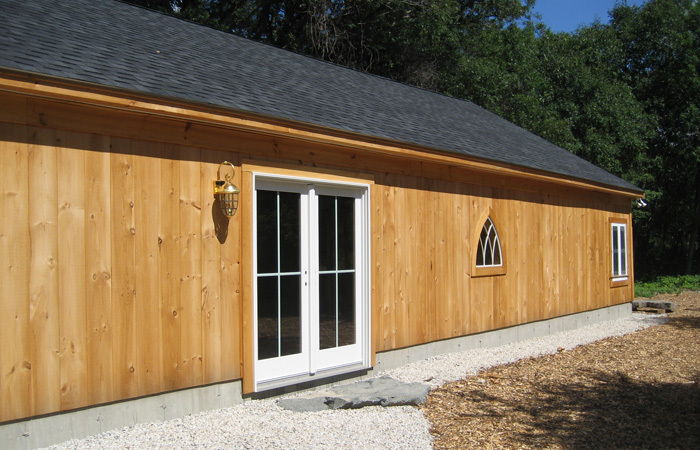 I just needed lumber that would match the pre-existing lumber of the barns and since day one Feuer has done just that." The rest is history. And a result, much of New England’s history has been preserved through Bartlett's work. Bartlett has also turned dilapidated barns into extra storage, housing for cows and horses, a couple for musical performances and – as with the recent project in Kittery – welcoming homes. As for his team, Bartlett's only employee is his son Jeremy that works on and off with his father throughout the year and a handful of electricians and plumbers when necessary. Certain aspects of Bartlett’s process require more than two hands and Jeremy has come to understand and help streamline that process. Like covered bridges, barns are a quintessential part of New England's history. Bartlett has made it his mission and life's work to save as many of these historic structures as he possibly can – and has chosen Feuer Lumber every step of the way. © 2019 Feuer Lumber Co. Inc.